On 30th March, 2017, for the 1st time I went to a Peat Swamp in Brunei. 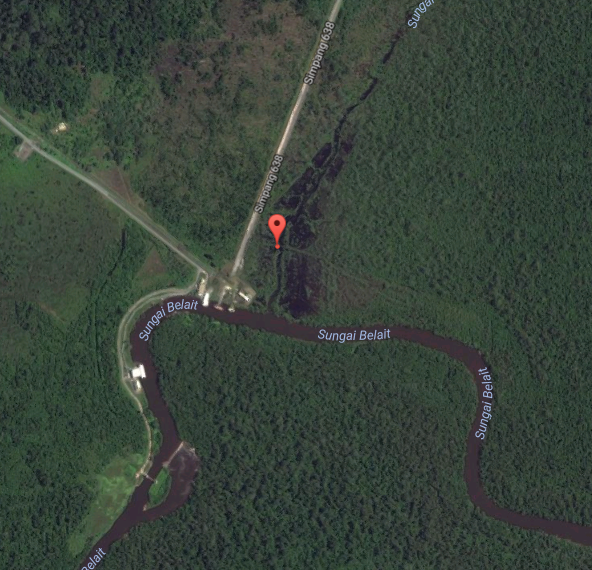 At around 9.15 AM , members of the Brunei Biotope group met at the entrance of Badas road which only leads to a Badas Water Pump Station(located about 7.5 km from the entrance of the road via Lumut-Seria Highway) at the end of the road, formerly, it had railroad tracks used when Brunei was still under British protectorate, but now about more than 90% of the tracks have been disassembled, whereas the rest are currently either rusting in the Peat swamp, or already submerged. 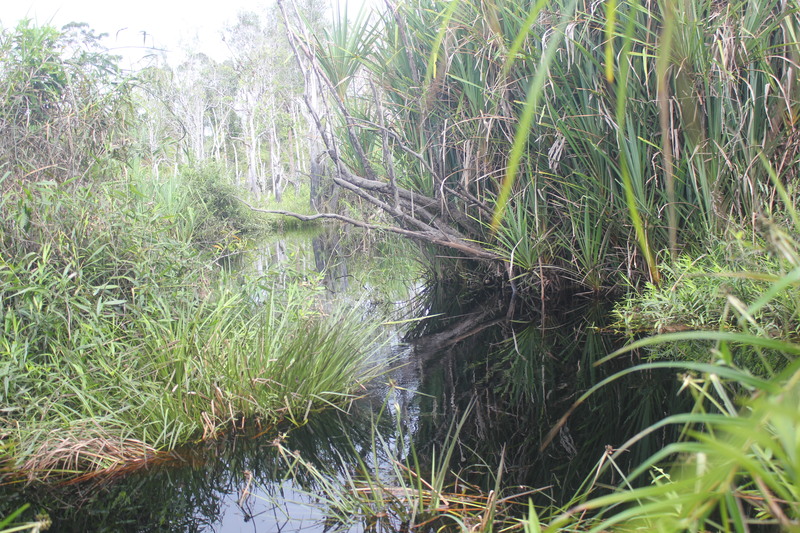 The Peat Swamp that we went to is known as Badas Peat Swamp, the water source of the swamp comes directly from the main Belait river, the swamp is also located at the start of the Badas river. We were only there from 9.30 AM – 12 noon .From the area we parked our cars at Badas Water Pump Station, we only walked about 300 metres before reaching the swamp. Once reaching to the sides of the swamp area, the pathway were flooded by the swamp. Crossing the knee high flooded area, we reached to a pathway which was slightly flooded but only until our ankles. walked around 20 metres on various terrains, hard clay, soft/muddy clay, black soil & the remains of railroad tracks which we used as a bridge. It was easy to walk on the hard clay areas, whereas at the areas where the clay was muddy, they acted like quicksand when stepped on, which at the same time releases pungent sulphur gas. 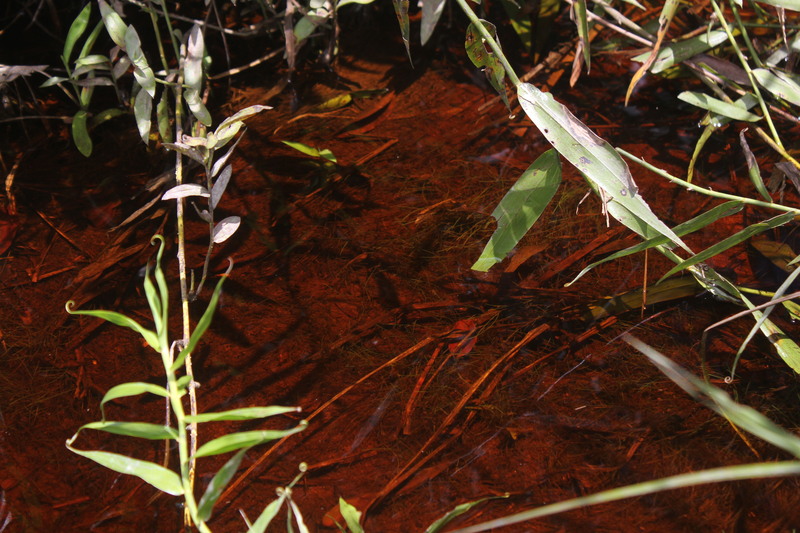 Areas where the water was about 10cm high, the substrate has slight black colouration, most likely peat. The colour of the water was very dark, as dark as coffee. We then decided to stop & not go further as there was already a large body of water which needs to be covered for traps & drag nets. 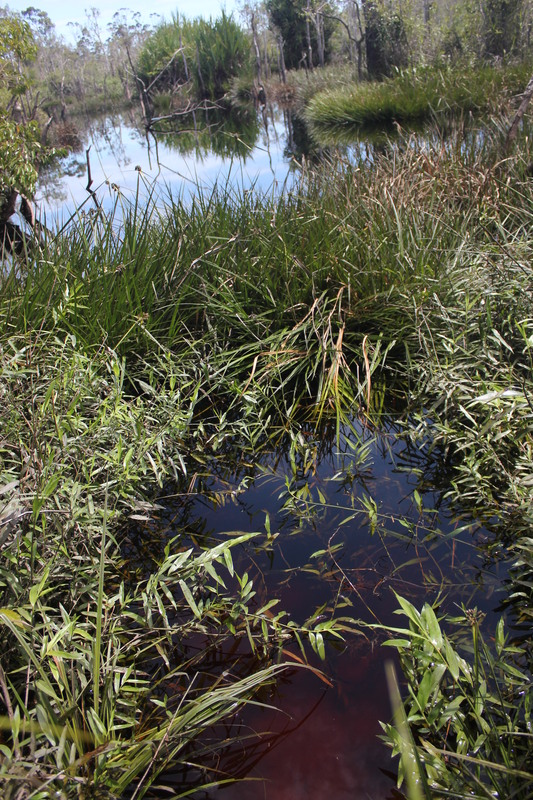 In the shallow areas we found an aquatic hairgrass species growing, possibly an Eleocharis sp. 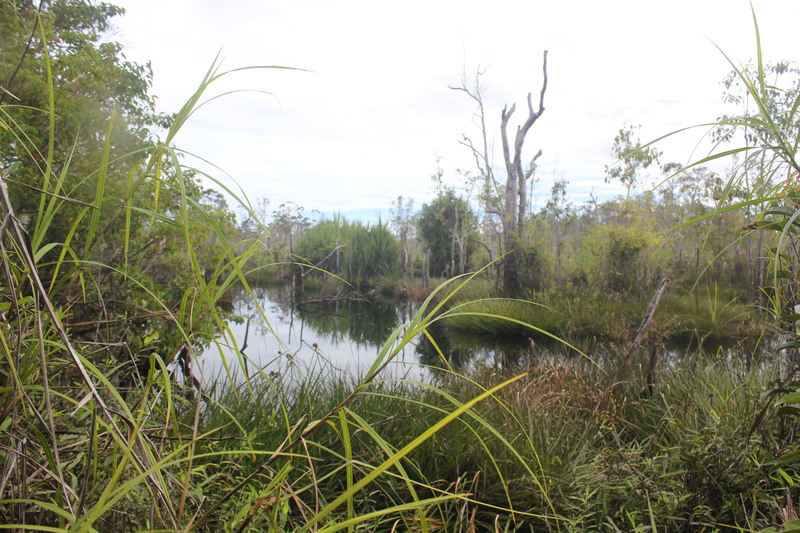 Areas where the water was shallow, around 10cm to 100cm, which is until knee high, a species of possibly Eleocharis (hair grass) can be seen growing abundantly on the substrate, other types of grass can also be seen growing all over the swamp. We tried to take an underwater video, but due to the visibility & colour of the water, most were unsuccessful. 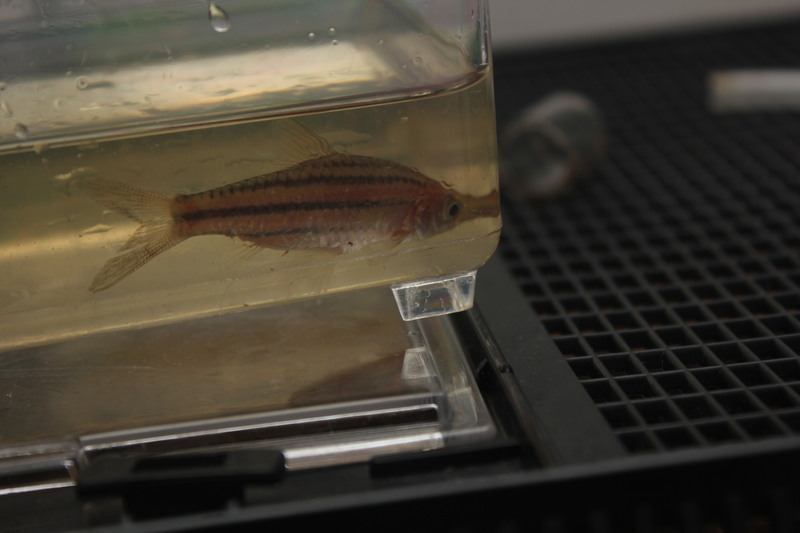 We then set traps and let them be for half an hour only to find that the fish were not so much attracted to the traps. 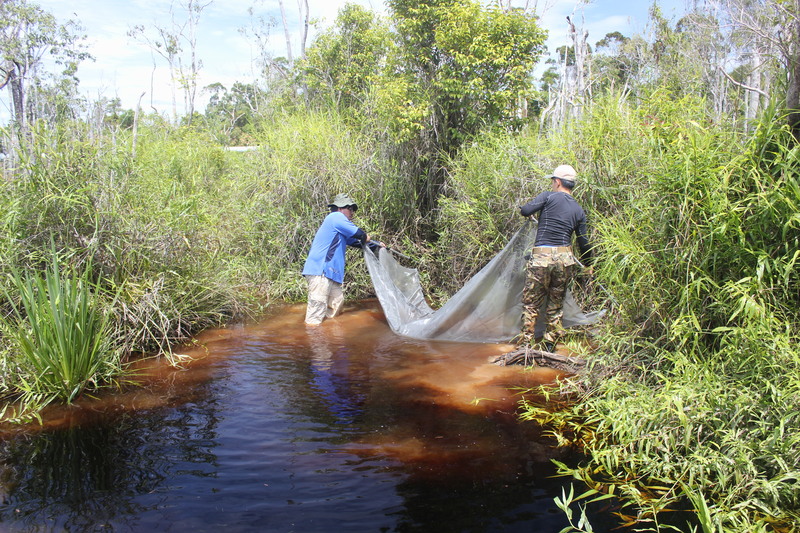 We then used the makeshift dragnet , which I made myself, & used it on several areas on our way back out of the swamp. We only used the dragnet at areas which were easily to walk on. 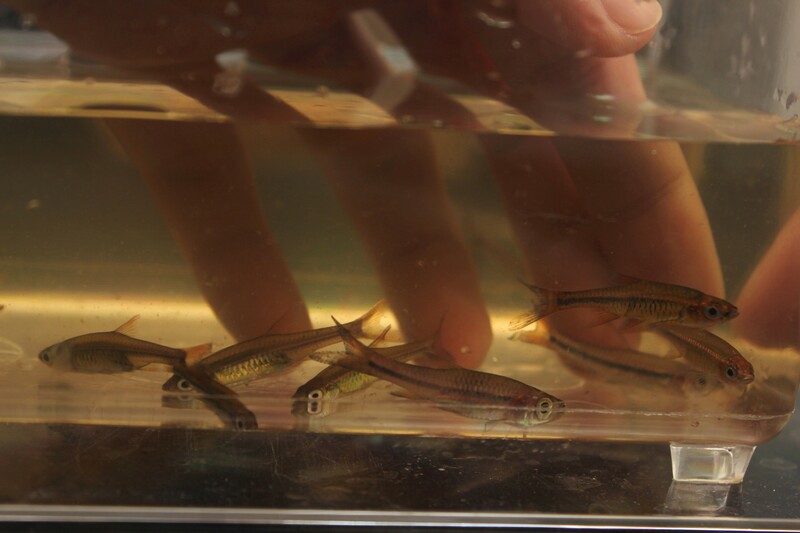 After multiple times dragging the net in various areas, we managed to catch a lot of mostly juvenile fishes and there were a total of 6 species including Desmopuntius pentazona, Desmopuntius johorensis (both adult & juvenile specimens which at 1st I thought were D. pentazona) , juvenile Rasbora cf. 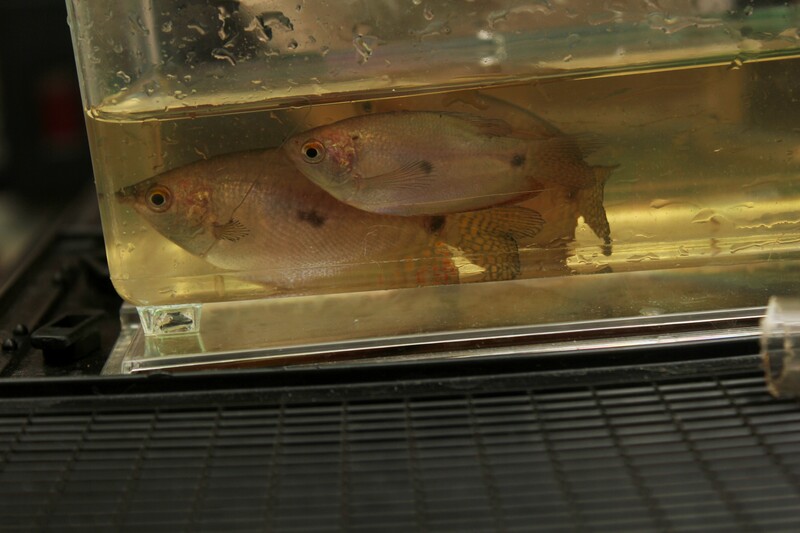 cephalotaenia, juvenile Trigonopoma pauciperforatum(Glowlight Rasbora), a juvenile Luciocephalus pulcher (Giant Pikehead) & 3 Trichopodus trichopterus (Three-spot Gourami), it is most likely that 2 of the Gouramis are a pair. 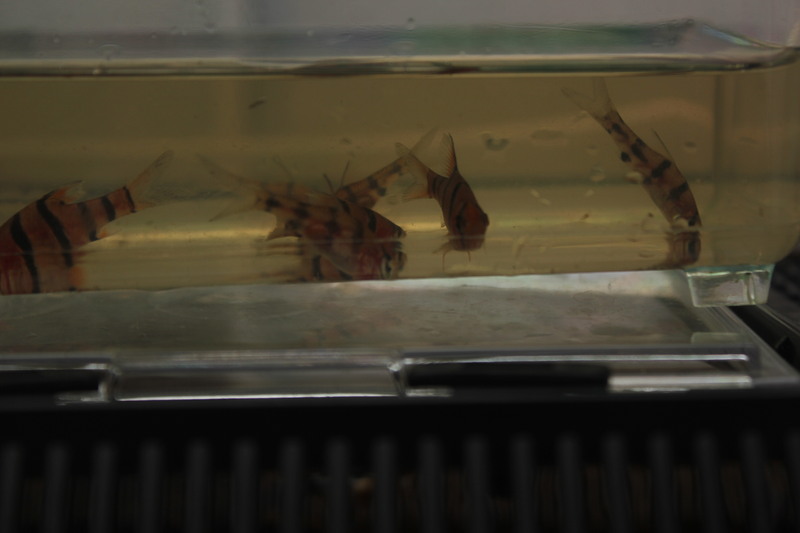 Juvenile Desmopuntius pentazona barbs can be told apart from their relatives D. hexazona by the presence of the black spot/line under the dorsal fin. 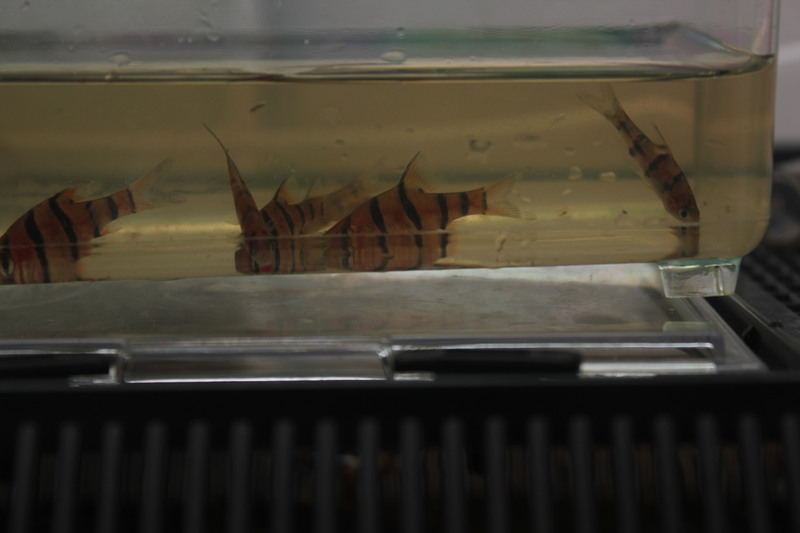 Juvenile D. johorensis (centre) showing their immature vertical striped patterning which later changes to lateral striping. This adaptation is likely a protective measure to blend well with groups of D. pentazona (left) in mimicry; safety in numbers! 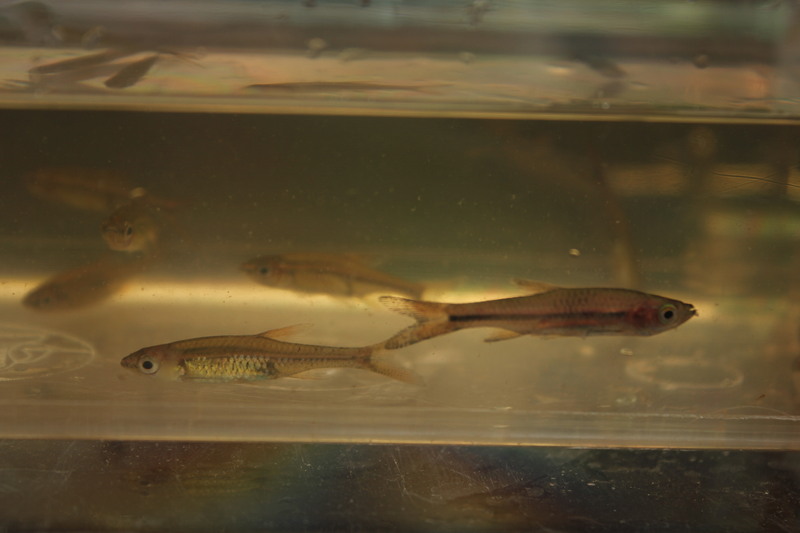 Glowlight Rasbora Trigonopoma pauciperforatum (left) with Rasbora cf.